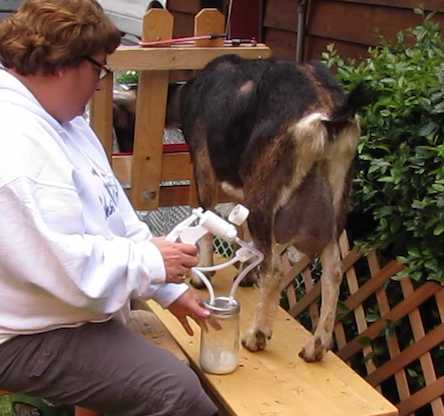 You don't have to stomp through the mud and manure to get to your milking chores everyday. Move your milking stand to a place that makes you and your goat happy. The stand pictured is easy enough to pick-up and carry, you can build your own with wheels on one end. Being comfortable, both you and your goat, is important for increased milk production and in getting the most satisfaction from the experience of raising and milking your goats. Once your goat has been trained to jump up on to the milking stand you can then move the milk stand anywhere, she'll come running when it's time to feed and milk. 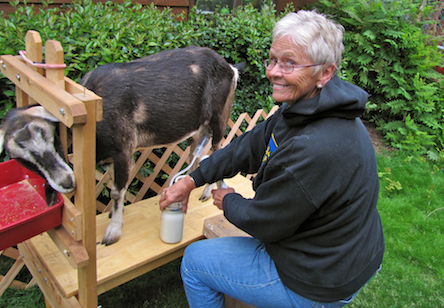 If you move your milking operation out on to the lawn like Nana, Joyce and Jack have done in these photos, you can just was everything down with the water hose when you're done and move your milking operation to another part of the lawn tomorrow. 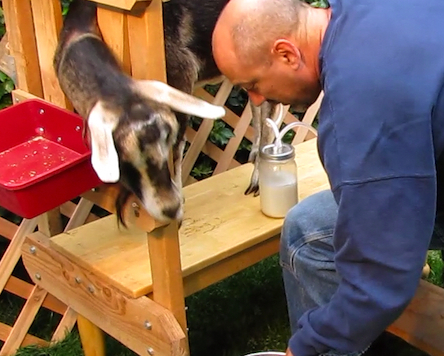 Build your own goat milking stand and enjoy.